Preheat oven to 200°C (400°F). To make the spiced seeded crumb, place the almonds, sesame seeds, chia, sunflower seeds, coriander, cumin, parmesan and salt in a food processor. Pulse until the mixture resembles coarse crumbs. Add the parsley and stir to combine. Divide the chicken between two baking trays lined with non-stick baking paper and sprinkle with the crumb mixture. Drizzle with the oil and roast for 10–15 minutes or until golden and cooked through. To make the slaw, place the fennel, cabbage, brussels sprouts, apple, chives, buttermilk, horseradish, vinegar, salt and pepper in a large serving bowl and toss to combine. 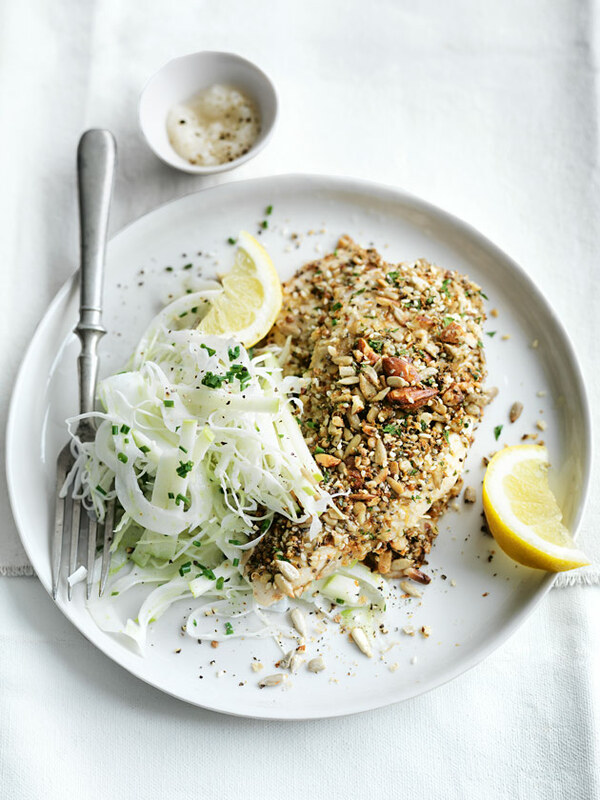 Serve the schnitzels with the slaw, extra parmesan and the lemon. Serves 4.